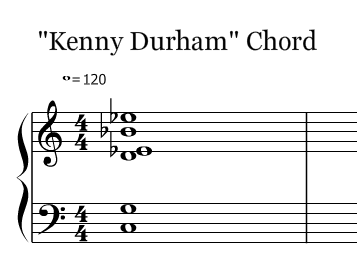 This beatiful way to voice a minor chord was used often enough by jazz legend Kenny Durham that authors of the "Piano Jazz Book" (Cher Publishing) decided to name it after him. Pull up a piano patch and play this Cmin9sus chord exactly as voiced. It's mostly built in fifths. Gorgeous. There's a track on Sting's Nothing Like the Sun album that ends with this chord and it's amazing. Can't remember which song though.